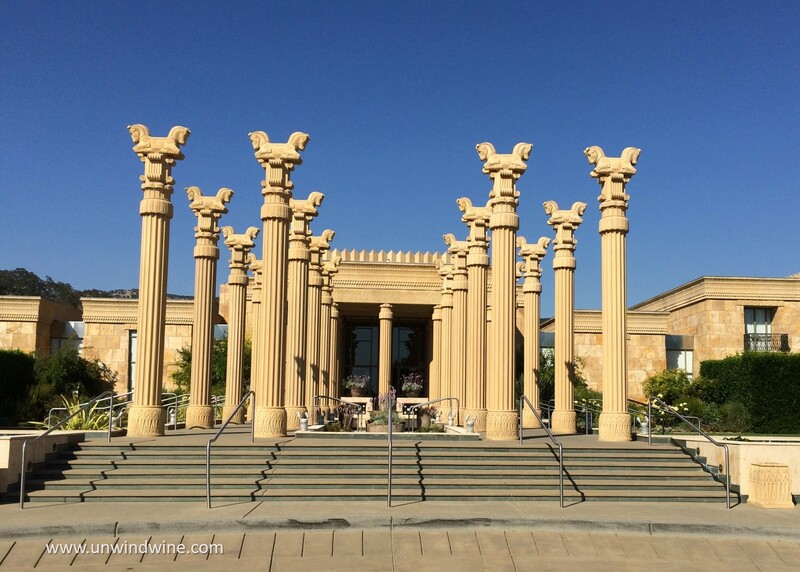 During our recent 'Pour Boys' Sonoma/NapaValley Wine Experience this month, we visited several longstanding favorite producers including Darioush. This was fitting since we first discovered and tasted Darioush at CCCC with Bill and Beth C on our first wine event together more than a decade ago. And, Dr Dan was our guest at a special Darioush wine dinner at Everest in Chicago, shortly after Linda and I visited the winery and did a barrel tasting with winemaker Steve Devitt during the construction of their magnificent hospitality center. The Darioush facility sitting against the Vaca Moutain range on the east side of Silverado Trail in southeast Napa Valley, is one of the most architecturally unique, impressive and stylish wine facilities in the valley. The building design is a tribute to the history and culture of the ancient city of Persepolis, the ceremonial capital of the First Persian Empire which is situated near the Persian city of Shiraz, in southwestern Iran, which happens to be the birthplace of founder Khaledi Darioush. Persepolis is the Latinized version of the Old Persian name, "Parsa" which means the "city of Persians." The striking architecture features a stand of columns from the great capital each featuring a pair of lamassus, bulls with the heads of bearded men and a pair with wings. Persepolis was discovered in the early 1930s. It is believed that king Darius I built the terrace and the palaces. 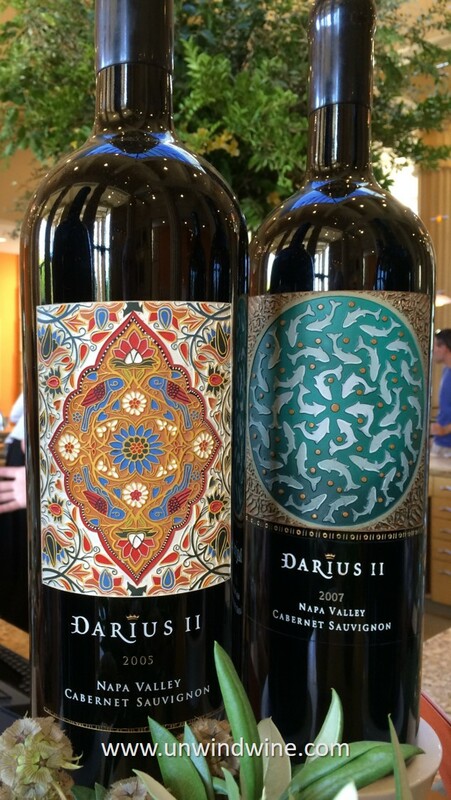 Darioush pay tribute to King Darius in their ultra-premium flagship label Cabernet which is packaged in stylish, ornate, elegant etched bottles (shown left in magnum and double-magnum). The magnificent facility surrounded by fountains and grounds is filled with artwork and architectural artifacts attributable to Darioush's heritage, the Persian history, culture and architecture. In retrospect, perhaps we should've scheduled a private tasting of Darioush wines since we're familiar with their wines that are found in distribution. Our history with Darius and Shahpar dessert wine date back to wines we acquired during a visit to the winery. Such a tasting would've been more comparable to some of the tastings we did at other producers during our trip this week. In any event, another key objective of our tours this week was to introduce Napa and some of the notable producers' and winery sites to members of our group who were new to the whole experience. range of their popular labels and varietal offerings. 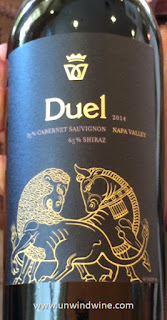 We did discover a new here-to-fore unknown label "Duel", Darioush' unique proprietary blend of Cabernet and Shiraz. 2015 Signature Chardonnay, Napa Valley from the southern Napa Valley estate and renowned Chardonnay vineyards of the Los Carneros district where the Napa and Sonoma Valleys come meet. Grown from two distinct blocks on the Darioush estate in Napa Valley and the Oak Knoll appellations, Duel is the a unique proprietary blend of two distinguished varietals: Cabernet Sauvignon and Shiraz. 2014 Signature Shiraz, Napa Valley from Darioush Estate Vineyards in Napa Valley and the Oak Knoll District appellation.